HANDS ON, wildlife control and interactive education. Globally acclaimed wildlife education, wildlife control and pest control. Call Melbourne Australia: (03) 9812 3322 to book! We do wildlife displays, education with animals, wildlife capture and relocation and everything else that comes with these general lines of business. For wildlife education, our specialty is kids reptile-themed birthday parties, school incursions with snakes and other interactive forms of educational display. We bring both venomous and non-venomous species to venues and have surgically devenomized deadly snakes to protect the safety of our clients and ourselves. The snakes benefit from this non-venomous state by the fact that there is no longer a need to handle them with sticks and tongs and we are instead able to treat the snakes with care and respect. In fact what separates our displays from all others is that we are nice to our animals and handle them gently! You won’t see the brutal mistreatment of animals in our wildlife displays that you often see on Cable TV shows. When not doing interactive education, we catch and relocate all forms of wildlife by all available means and also do others forms of pest control work, for government, business and private individuals. We are based in the Australian State of Victoria within the constraints of relevant laws and permits, such as the Wildlife Demonstrator’s permit, zoo permits, controller’s permits and when travelling elsewhere use equivalent permits as needed under relevant state or National Laws. We also have public liability insurance cover, relevant Children’s and police checks and cards as well as an unrivalled perfect safety record spanning more than 30 years in the wildlife education business. 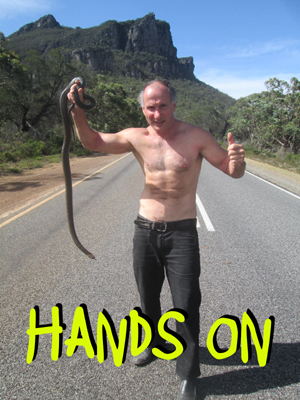 Our venomous snake handling courses are on the official lists of all State Wildlife Departments in Australia, meaning that one of our certificates is instantly recognized and allows graduates to obtain catching permits without having to show additional evidence of handling expertise to the relevant state authority, saving our graduates time and money. If it is not “hands on” (as in us), then it is a risk!